Old Urbanist: Thinking Small: The Narrow Streets "Movement"
Thinking Small: The Narrow Streets "Movement"
An awareness of the virtues of the narrow street seems to be growing on urbanist blogs and websites. 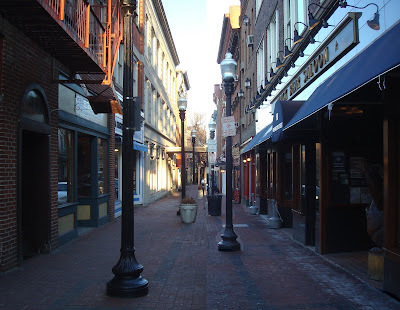 A recent commenter directed this blog to his excellent site, New World Economics, where a convincing (and entertaining) case is made for the crucial importance of "really narrow streets" to successful urbanism. This is a new and distinct position from that of the New Urbanism, as it argues for a revival of traditional city forms, not simply those of 19th and early 20th century America. As it happens, his is not the only voice advocating for narrow streets : David Yoon, a self-described "writer, designer, and urban planning geek," has created a website devoted to digitally shrinking the generously-proportioned roadways of Los Angeles. Again, this does not appear to have grown out of a New Urbanist frame of thought, but out of first-person exposure to the form of the traditional city. Other writing on narrow streets has appeared in the recent past: at Strong Towns, for instance, a declaration that "narrow, slower streets ... are a key component of a productive place," while Oakland Streets proclaims "the narrower, the better." A handful of examples does not really make for a "movement," thus the quotation marks, but there is a discernible common idea here: that the most distinguishing characteristic of the traditional city and the most important determinant of the feel of any urban space is the width of its streets. Again, this does not appear to be a rehash of New Urbanist thought: of The Smart Growth Manual's 148 principles of urban planning and design, not one is devoted to street narrowness as a desirable characteristic per se, while the examples of "slow flow," "local streets" (p. 8.10-8.11) show rights-of-way as wide or wider than heavily-used commercial thoroughfares in major European cities (e.g. here, here, or here) in order to accommodate vehicles. A narrow streets approach, by contrast, rejects attempts to standardize street widths around the needs of the automobile, and sees the auto-unfriendly characteristics of very narrow streets as a feature, not a bug, of their design. As this is just a quick attempt at a summary, any thoughts on this subject are welcome. The trouble is, this just converts city centers into malls -- people drive into town, park, walk around for their errands, and drive away again. At night the mall is closed and empty. People like the mobility that cars give them. City planning should try to accomodate that. Using design to make people give up their cars will simply encourage them to leave and not come back. Why would it be closed and empty at night? Obviously people will be living in all the buildings, on residential streets and above all the shops? Mobility by foot or bicycle is equivalent to mobility by car, when you reduce the scale of a city. If people want to leave and never come back, they can drive to somewhere where they would be more comfortable driving everywhere, which is like everywhere else! Plenty of people would love to stay and move in. I became aware that simple narrowness is not the only answer when I drove into Vienna from Sopron one Sunday morning many years ago. The street was a wide 4 lane thing, though with huge sidewalks. The street was a glorious lively place because of those wide sidewalks and because the buildings were all the Euro-style ones with ground floor retail, and a mix of professional and residential above. The balconies were full of people, notably old people just looking, flower boxes, bikes, furniture, and 'stuff'. The sidewalks were full of people from these buildings and the purely residential ones behind them. The huge sidewalks were littered with retail stands from fruits to video games and cafe tables. But no doubt tight regulation, multiple licensing, regular municipal inspections by ignorant and supercilious dolts and planning the planny plan by equally doltish "planners" would improve that Viennese street scene. You have to add trains for mobility of course, plus a few buses, taxis and so forth. One of the world's largest cities, Tokyo, with 36 million people and 9 international car companies, is about 80% "really narrow streets" where cars generally don't go. So the various complaints that "it won't work" are basically the result of ignorance and lack of experience. It already works. "The trouble is, this just converts city centers into malls -- people drive into town, park, walk around for their errands, and drive away again. At night the mall is closed and empty." This is true if you have an exclusively commercial core surrounded by parking lot. You're right, that's essentially a suburban shopping mall made to look like a traditional city. But that's not the proposal here. The proposal is to surround the commercial area (shops below, apartments above) with residential neighborhoods also with really narrow streets. With car traffic removed it becomes a nice, quiet city with everything you need within easy walking distance. "People like the mobility that cars give them. City planning should try to accomodate that. Using design to make people give up their cars will simply encourage them to leave and not come back." You have it backwards. Rather than city planning accommodating people's love of cars, in its current state, city planning is FORCING them to drive by design. You can't get by in most cities without a car, even those with "good" public transportation. What exactly are you complaining about? Our cities are designed to make people drive. By the way, I was the one that left the link to New World Economics, and it's not my site! Glad you picked it up though. He has some awesome ideas. Can't do it in cities where earthquakes are a risk. Otherwise, rescue and emergency vehicles can't get through the debris. San Francisco found that out in 1906. Now they have wide streets. I love it when people talk about re-adopting Traditional model as if it were either a wishful option (e.g. "People won't give up their cars"). People are going to give up their cars as oil prices climb--look at Europe! Sure, they got their scooters, but their are plenty of towns and cities that are, basically, pedestrian exclusive (Brussels and Leuven Belgium come to mind). With Peak Oil already past, or happening as we speak (debates vary), road-less development is our ONLY option. Consider how much oil has rebounded despite a slow economic recovery. The next ten years are going to be really interesting as people who talk about Peak Oil, as if it is some distant thing, realize we are already in the throws of it. I love how people can find 20 reasons why it can't be done, despite the fact that it is done all over the place. Of course Tokyo can't possibly have narrow streets - it's earthquake prone! People can't live without their car - even though many millions do in far greater comfort than the pathetic lifestyle we americans have become forced into by decades of bad planning. The suburban mall was originally designed by a Viennese immigrant, Victor Gruen, who wanted to recreate the Traditional City shopping streets of this hometown. Gruen eventually considered the suburban shopping mall to be a failure. He moved back to Austria and died in a country house outside Vienna. "I love how people can find 20 reasons why it can't be done, despite the fact that it is done all over the place. Of course Tokyo can't possibly have narrow streets - it's earthquake prone! People can't live without their car - even though many millions do in far greater comfort than the pathetic lifestyle we americans have become forced into by decades of bad planning." One of the things you discover after doing this awhile is that most people -- including the professional "New Urbanists" -- are drooling morons. I suspect it's because so many of the "New Urbanists" sit at drafting boards (archaic!!) making pretty pictures, writing books on how great things will be, if only you follow their plans(1 million dollars, please) and not enough time actually walking city streets, as I have in Tokyo, NYC, and, yes, South Norwalk among many others. Which is why all those books are full of pen and ink drawings and no photographs. I would also like to point out that South Norwalk has an old street pattern. Washington St. is actually the widest street in the neighborhood and is, unfortunately the artery though town east and west at that point. Also the neighborhood has too low a diversity ratio with too many destination restaurants, not enough of the kinds of businesses to support local traffic(no grocery) and too few local businesses to support living there. J Carlton: Thanks for reading and commenting. As for SoNo -- true enough for Washington Street, but a new full service grocery has actually just moved in around the corner on North Main Street. Throw in a few banks, the pharmacy, the post office, and the coffee shops (one of which opened less than three months ago), and it's become a reasonably functional place for local residents. I have always been interested in how cities "work", especially after I had been introduced to Jane Jacob's city books. I spent a lot of time traversing Eighth St between two of my favorite bookstores and it was interesting to see her observations still in place decades after she wrote about them. I'm also a lifetime fan of railroads and transit systems. I actually spend summer weekends volunteering at the switch tower in SONO. I was down there today in fact. And Tokyo is not all narrow streets as new world economics would have us believe. Tokyo is almost as much a victim of hypertrophism as New York, espeicially in the new development areas on the outlying islands. Odaiba could easily be an American development rather than a part of Tokyo. Good job Charlie. I came here from Nate's site at New World Economics, and, having lived in to numerous cities, new and old, in various parts of the world, I would have to say that the most interesting parts to visit AND live in are always the old parts - which have the narrow streets, and are very walkable. On my first visit to Portland, Or a couple of years ago I was trying to work out what was so good about the city centre - it felt great to walk around there but why? It is because they have half width streets, and half that width is sidewalk - very human scale and feels very good to walk around. Also, very little on street parking, so most of what you saw was streets, buildings and people - the cars are not missed. A key element of success, as alluded to above, is to have people living above the commercial areas. Unfortunately, much modern "zoning" precludes this! The ski resorts (I used to work in that industry) worked out that the pedestrian village centre, with people living (staying) above was key to making the village feel like a good place to be. It works just as well in normal towns and cities too. Anyone who lives in those old, funky areas couldn't be paid enough to leave. The biggest thing is that if you live in those areas, and don't need to waste money on owning a car, you have a lot more to spend on other stuff. And because you don;t have a car to load up with "stuff' at a big box, you tend to spend more on local services - coffee shops, restaurants, local theatre, custom furniture, etc. much more of your $ spent stays local. That, in my opinion, is why these walkable areas work so well. Paul -- thanks for your comment. One of the reasons that the narrow street concept doesn't feel like such a leap to me is that I also have had the good fortune of living in places which had them in abundance -- Trastevere in Rome, and Siena. Once you've spent a semester or two living in such places, with no obvious hardship despite no access to a car, and seen thousands of others doing the same, the concept doesn't seem so farfetched. It does make me wonder, with an entire generation of students who have spent semesters or years abroad in traditional urban environments in Europe, Asia and Latin America, whether those experiences might be altering, bit by bit, Americans' conceptions of urbanism and urban living. David Yoon (of Narrow Streets: Los Angeles) here. I really, really, really dig your blog—especially all this lively debate above about cities as malls, emergency contingency concerns, and even the effect of studying abroad on future city planners (I lived in Japan for 4 years, and then Boston for 6—definitely had an effect on my SoCal-bred brain). David -- thanks for those kind comments and for the link. Finding your site was a "kid in a candy shop" moment for me, and I simply couldn't resist applying your technique to my own town. Thanks for sharing your discovery and all those fantastic photos. When it comes to narrow streets seeing is believing! Great finds -- thank you, Stanley!